Calathea zebrina or Zebra plant, a native of Brazil, is an interesting plant for the home or greenhouse. Plants reach 3 feet in containers. Leaves emerge from basal rosettes and may reach 2 feet long by 1 foot wide. Blooming Time: Spring. Flowers are inconspicuous. 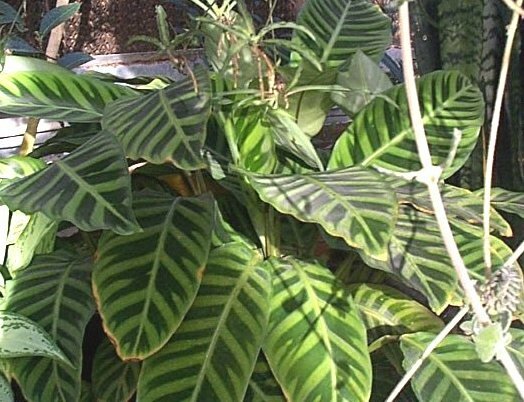 Culture: Calathea zebrina need shade and temperatures above 55°, but they need good light for a good, rich leaf color. We use a soil mix consisting of 2 parts peat moss to 1 part loam to 2 parts sand or perlite. Good drainage is necessary or the plant will stagnate, which is a common problem. The plants should be kept moist at all times and leaves should be misted often. Fertilize every 2 weeks during the growing season and once a month during the winter months. Repot as often as necessary to avoid root bound conditions. Propagation: Calathea zebrina are propagated by division in spring. Calathea zebrina was featured as Plant of the Week April 6-12, 2001.